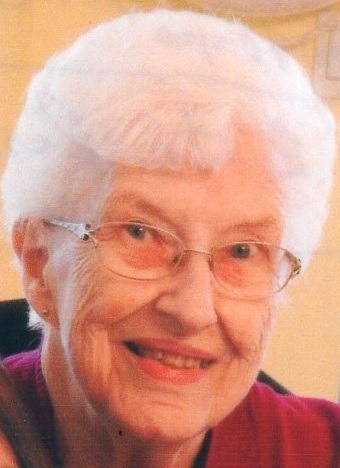 Kathryn “Katie” L. Roberts: 90 of Elkhorn, WI died Saturday April 6, 2019 at Holton Manor Nursing Home Elkhorn, WI. She was born October 18, 1928 in the Town of Farmington, Jefferson County WI the daughter of the late Gilbert J. and Lottie I. (Potter) Haag. She was united in marriage to Howard D. Roberts on October 16, 1948 at St. John’s Lutheran Church in Jefferson, WI. Katie and Howard moved to Elkhorn, WI in 1963. Howard died November 4, 1990. Katie was a member of First Evangelical Lutheran Church of Elkhorn where she served as church secretary from 1968 until her retirement in 2006. Katie enjoyed working puzzles, knitting and reading. She was a loving and devoted wife, mother, grandmother and great-grandmother who will be dearly missed by her five children: Stephen (Lynn) Roberts of West Bend, WI, Karen (Dennis) Henzig of Randolph, VT, John (Sheryl) Roberts of Delavan, WI, Barbara (Randy) Canales of Burlington, WI and Thomas (Susan) Roberts of Elkhorn, WI, fourteen grandchildren and eight great-grandchildren, by her sister, Isola Millett of Oconomowoc, WI and by many nieces and nephews and a host of other relatives and friends, especially Deb, Kristi, Kristy and Kay. Katie was preceded in death by her husband of 42 years, Howard, her sister: Genevieve Zimdars and her three brothers: Roy, Darwin and Adolph Haag. Visitation will be 9:00 AM to 11:00 AM followed by a funeral service at 11:00 AM Tuesday April 9, 2019 at the First Evangelical Lutheran Church 415 Devendorf Street Elkhorn, WI with Rev. Preston Heuer officiating. Burial will be at Hazel Ridge Cemetery Elkhorn, WI. Memorials may be made in Katie’s name to: First Evangelical Lutheran School of Elkhorn. On-line guestbook is at www.haaselockwoodfhs.com. Arrangements completed by Haase-Lockwood & Associates Funeral Homes of Elkhorn, WI.